Okay - I realize that the days of anyone looking cool wearing a Bluetooth earpiece, if indeed they ever existed, are long since past. However, there are some types of work activities that truly do benefit from the use of these devices, regardless of whether they make you look douchey. I’ve had my struggles finding good, uncompromising solutions in this area. As I’ve discussed here before, the market for high-end Bluetooth earpieces seems to be be dwindling, replaced largely by lower end items that either price the market down enough to drive out high end players, or work adequately for listening, but aren’t necessarily well set up for conversation. For a while I’d decided to get by with my Jumbl Bluetooth receiver. This device has the benefits of working with any set of wired headphones, which lets me put the conversation in both ears - a bonus around background noise - and being inexpensive. When my first Jumbl failed, I went looking again and came across an earpiece by Honshoop (nope - I’d never heard of them before either) that promised noise cancellation and a bevy of other features for about $30. While that seems too good to be true, the price of entry was worth the risk, so I took the leap. I wrote up a brief review of it... sort of. The thing is that, a couple of weeks into owning it, it disappeared from Amazon. There were other models under the Honshoop name, but not the one I’d purchased. This is not confidence inspiring, but given that I already had mine and it was working well, I moved on. And the Honshoop worked great until I lost it. It just disappeared one day - I’m sure I must have dropped it out of my backpack - never to be seen again. And so the search began anew. The remaining standout in the high-end market - aside from Apple AirPods, which I’m sad to say don’t fit in my ears - appears to be Plantronics. Unfortunately, back then when I tried to purchase one through Amazon I had to pay for shipping, and attempting to purchase thru the website got me nothing but an error page. I decided to look again and I was delighted to find I could now order a Voyager 5200 thru Amazon with Prime shipping. With about a month of experience I have to say that this is what I’ve been missing from the dearth of high-end devices. Sound quality is very good, and I’ve actually had a colleague who thought I was in my office rather than in the car during a call. There is a video on Amazon that demonstrates the efficacy of the noise cancellation and, after experience, I believe it. The 5200 has a comfortable, over the ear design (similar to the Honshoop, which I assume copied from Plantronics). It’s lightweight and feels good even after having been on the ear for an extended period of time. It has multiple buttons with clear purposes, allowing for the activation of audio, such as podcasts, or for Siri, without any confusion between the two. A separate button provides for on-device muting, which is an absolute bonus feature for taking calls on the go. This feature means you just have to tap the earpiece button to mute the microphone instead of reaching for the phone. An additional component of this feature is that the device detects if you start to speak with mute engaged and tells you that mute is on. This is a great idea, since you don’t have a visual indicator for it, and it promises to prevent unheard soliloquys that otherwise occur. However, in practice I’ve found the reliability of that feature to be mixed at best. Battery life is good, lasting through long days with multiple calls so far. Putting it on towards the end of the day and hearing that it still has five hours of talk time available inspires confidence in the device. Plantronics does offer a case for it that has a battery pack in it for charging, similar in concept to the AirPods case. This is an extra cost item that looks well put together, but so far I haven’t run out of battery between charges. If I were traveling in a situation without easy access to other charging sources it might be worth considering. An additional feature for the Plantronics Voyager 5200 is the Plantronics Hub iOS app that can be downloaded for it. The app offers some basic information, including an indication as to whether the device is connected, a readout of whether it is on the ear or not, and the amount of available talk time. Included here are also two components that function as a replacement for the paper owners manual. Buttons and Lights shows you what the different components on the earpiece do, while How do I provides the step-by-step instructions for things like pairing, answering, muting, and launching Siri (or your personal digital assistant of choice). The app also offers the ability to change multiple settings on the earpiece, including things like ring volume, whether you want to use voice commands to answer or ignore a call, and the settings for the aforementioned mute features. Anyone who has ever had to follow the arcane multiple button-press dance that it used to take to set up these kind of features on a Bluetooth earpiece will appreciate the app for this reason. And let me give a special mention of appreciation to the answer or ignore voice feature. In this day and age even cell phones routinely get spam calls. I don’t know anyone in Coral Springs, FL or Cumberland, MD, so I’m certainly not going to answer a call from them. However, the ringing of the phone takes over the whole device, so any such call that comes in interrupts the music or podcast that is playing until one dismisses the call. Typically that means reaching up to the screen and tapping "decline", which is not ideal in the car. With this feature you can simply say "ignore" and the bot on the other end simply disappears. And given the disappearing act performed by my Honshoop earpiece, I also appreciate the fact that the app has a "find my headset" feature which, like Find My iPhone, makes your missing earpiece put out an audio tone to help you locate it. You’d still have to have a rough idea of where you lost it, but at least it’s a start. It should also be noted that the app works with multiple Plantronics models, so if a different version trips your fancy, the app may be available for that as well. The two niggles I have with the device thus far center around the location of the volume buttons and the "earbuds" it comes with. For some reason, the volume buttons are placed at the top of the device. Just to look at them this may not seem to be a problem, but in practice the location is not ideal. Try to simply push down on the buttons while wearing the device and you simply push the whole device down on to your ear. And because of where they are at, and the general shape of the earpiece, finding a location to hold against when pushing down is a bit awkward. Ultimately, I ended up placing my thumb at the bottom of the battery at the back of the ear to hold against it while pushing the volume buttons. This will likely become second nature over time, but it isn’t terribly natural. In addition, when volume buttons are at the back of the device, as with similar models, the top button is "up", and the bottom is "down" - straightforward and intuitive. Because they are on the top, there isn’t an intuitive sense of which button is "up", and which is "down". They are marked with a "+" and "-", but of course you cannot see these when you are wearing it. It’s a small thing, but a curious one, because it appears as if there is room on the back for the volume buttons. The challenge with the “earbuds” - and this is how the documentation describes them - is that they aren’t earbuds. They are flattish silicone gel discs. With some fiddling about I finally figured out that these are the Plantronics variation of the type of earpiece that puts gentle pressure on the inner earlobe to keep it in place and against (but not in) the ear canal. Approached that way sound quality with the discs is good, even allowing me to hear clearly in my considerably not quiet car, and they even sound clear using it to listen to podcasts while riding my trike. Playing around with the three different sizes of these allowed me to select the one that made the earpiece feel secure on my ear as well - e.g. that it wouldn't jiggle about when I shook my head. For me, surprisingly, that was the biggest disc (I have smallish ears). Although sound quality was good, I did decide to see if I could improve it with something like a more traditional earbud fitting. To test this, I ordered one such kit from Amazon. This was not inexpensive, given what you get - about $14 for what amounts to earbud gels and (what I suspect is the cost center) a bespoke piece that fits into the earpiece and mounts the earbud gel. After some testing back and forth, I find that these do not result reliably in the earpiece being solidly in the ear canal. I wonder if it’s simply the case that the design sits too far outside for this to be practical. That’s fine, though, because I also do not detect any significant difference in sound quality between the stock silicone discs and the aftermarket earbud. And, given that the disc sits outside the ear, it may well be the case that they will be comfortable for longer time periods. Your mileage may vary, of course, but I’d recommend spending some time with the stock earpieces before dropping coin on the aftermarket item. If your needs include the type of usage that goes with a traditional bluetooth earpiece like this the Plantronics Voyager 5200 is an excellent choice. It’s more expensive than many similar looking competitors on Amazon, but you are getting what you pay for. The Pessimist’s Archive Podcast is a treasure trove of historical information about people’s reactions to new technology as it emerges. Before I go into detail on it, here’s a little spoiler: they typically don’t like it. The podcast has been out for about a year, and it has a... casual release schedule (there are 9 episodes so far), but what it lacks in quantity it more than makes up in quality. The episodes are well researched and tightly produced. The host is Jason Feifer, who is also the Editor-in-Chief of Entrepreneur magazine. Each episode also features a variety other voices from people related to the topic on one way or another, and the delivery is done in a delightful tongue-in-cheek fashion. Episodes run around 30 minutes, give or take. Overall, the podcast and twitter feed bring a new perspective to the very common complaints we hear nowadays about how screens, or social media, or fill-in-your-own-example-here are a menace and/or are destroying our society. Perhaps my favorite episode thus far, unsurprisingly, is Episode 6: Bicycle, which reviews and reveals the severe dangers to society, the economy, and women’s morals, represented by the demon two-wheeler. All from the perspective of the 1800’s mindset, of course. As is always the case, each episode is also accompanied by a list of links to the articles and references discussed, giving an opportunity for a deep dive into the topic in question (How the Bicycle paved the way for Women’s Rights, might help explain that concern about the impact on women’s "morals", for example). If the general sky-is-falling perspective on our ever-changing times makes you a little crazy (as it does for me), or if you are just a fan of the bicycle and all of its iterations, I highly recommend checking this out. The re-launched MST3K (on which she has also written). ...And many, many others. Basically, if it's geeky and good, Felicia Day has very possibly been involved with it. This particular book is, as mentioned, a memoir. It recounts her life, beginning from a childhood in the Deep South, home schooled and living a self-described off-kilter life, and continuing up through her professional career, into very nearly current day (the Audiobook was released in 2015) and reflecting her struggles with Gamergate. Anyone can relate the details of their life, moving from time to time and from event to event. You've probably had an uncle or grandparent do this to you at family gatherings while you desperately looked for some means of escape. What so often (if not always) makes the difference is the telling of the story. And it is in the telling that this book truly shines. It's a rare book that can truly make me laugh out loud, but this did on multiple occasions. The writing is quick and delightfully clever. She manages to be both wonderfully self-deprecating and reflect pride her accomplishments, sometimes simultaneously. As I mentioned before, it's read by Felicia herself, and this magnifies the telling - like the best audiobook performances, the narration feels like a conversation, a storytelling, not a reading. It's intimate, familiar material for her, and she delivers it with all that entails. I was genuinely sad to reach the end of the book. As a bonus, because the audiobook was recorded after the tree corpse version's release, there is additional material about events that occurred as part of her book tour. These are very fun as well. So look - if you are reading this, you probably already know and love Felicia Day's work. You owe it to yourself to pick up (or download) this book. Station Breaker by Andrew Mayne is a speculative fiction piece surrounding a private company astronaut, in a near future setting, where trips to and from space are handled by a Space X-like company. The setting is somewhat reminiscent of The Martian, in that it presents bits of technology that might not quite yet exist, but you know are just over the horizon. That setting in time, however, is where the resemblance ends. Astronaut David Dixon is on his first actual space mission and, even before liftoff, things don't seem quite right. Why is the mission commander, a seasoned NASA astronaut, surreptitiously packing along a pistol? This story is a breakneck-speed adventure from start to finish. Setting development is efficiently handled, giving a feeling for time and location while trusting the reader to come along quickly, and then never looking back or slowing down. The narrative is in first person, mostly present tense, giving the impression you are seeing things as David Dixon sees them, and keeping you directly in the moment. You, as has David, have been dropped into a very difficult situation with no explanation of what is really happening, nor of why, keeping you on the edge of your seat. For the hard science fiction aficionados there is real time and attention paid here to the physics of things, both in space and otherwise. Still, this is done in a way that won't be intimidating to readers unfamiliar with these components - if proper physics is important to you, it's there. If it isn't, you won't be forced to pop over to iTunes U and take a course to understand what is going on - it's nicely laid out mostly as color to the overall story, and briefly, clearly explained when it's more important to what is going on. The physics, and the story, don't only happen in space. This story rolls its way across multiple locations, Indiana Jones style, with some considerable effort on the part of our main character. It's an adventure from moment one. As (almost) always, I experienced Station Breaker via audiobook. This story was my companion for many a bike ride thru the countryside (one ear only, the other open to the road, of course). It is read by Kyle McCarley. He narrates a number of audiobooks on Audible - 61, based on a narrator search - but this is my first experience with him as a reader. It sometimes takes me a little while to adjust to a new reader - each narrator has their idiosyncrasies, and while an audiobook is certainly the presentation of the author's material, it's also a performance, and the narrator is absolutely a factor in the experience of the book. In this case, I enjoyed his voice, but initially found his way of emphasizing certain words - particularly the word blood (which appears several times early in the book) - took a little while to adjust to. However, I often find that, if I press on a bit, I do adjust, and this was the case here. And in fact, given that time I found that Mr. McCarley does an excellent array of voices, and is able to maintain them consistently throughout, which is certainly not the case for every narrator. All in all, the book was an excellent companion for multiple rides. It ends on a bit of a cliffhanger, and there is a second book in the series - Orbital - which I have lined up in my cue. Notably, the second book is also read by Kyle McCarley, which offers a nice bit of continuity - it can be somewhat jarring when the narrator changes partway thru a series and all of the characters you've come to know sound different. If you are looking for a high-adrenaline thrill-ride, with a bit of a science fiction angle to it, I can happily recommend Station Breaker. Back in December of 2016 I purchased a Tom Bihn Synapse 25 and, after a couple of weeks of ownership I wrote up an initial review. The central compartment swallows a lot of stuff. I can easily fit a martial arts uniform and basic gear (belt, ankle brace, mouth guard) or winter biking gear along with a bag of trail mix or a lunch bag. In fact, if you aren't a heavy packer I suspect this bag could easily be used as a carry-on for flights. I've had the opportunity to use the Synapse for multiple overnight trips, and the central compartment readily manages everything that is needed for such a trip. What's more, having the single bag to keep track of simplifies the travel quite nicely. And the carry-on question? That turned out to be more interesting than I expected. In my relatively limited air-travel experience, it seems that most airlines will allow you both a carry-on item - generally a small luggage item - and a "personal item" in the cabin. The dimensions of the carry-on luggage are pretty well established - there's usually a metal frame at the gates you can stick your carry-on bag into in order to see if it fits, and several luggage companies make specific pieces designed to fit within that size window. The size of the "personal item" is less well defined, but as a general rule seems to involve being able to fit under the seat in front of you. In the past I've used my Ristretto as my personal item, it being able to carry my iPad, iPhone, wallet, etc, nicely enough. For our recent trip to Detroit - a five day adventure - I decided to put my previous prediction, as well as my minimalist packing skills, to the test, and use the Synapse as my carry-on luggage. I also brought along my Ristretto, figuring I would pack my iPad and such in it after I arrived at the airport and use it as my personal item. The Synapse worked quite nicely as a carry-on item. In most respects this is not surprising - it's measurements are just below the standard size requirements for such an item. What was more surprising was this: it actually appears to work as a personal item. Which is to say that, tightly packed with clothing and hygiene supplies sufficient for five days of stay in The Motor City, as well as my iPad, and all of my usual supplies (minus my Swiss Army knife and nail clippers, of course) the Synapse fit under the seat in front of me. While I packed the Synapse in the overhead and used the Ristretto on the way to Detroit, I set aside the Ristretto for the way back and simply slid the Synapse under the seat in front of me at the required intervals. Your mileage may vary, of course - this one example may not be indicative of what other airlines, or other circumstances, might allow. But it did mean that I had access to all my stuff while in my seat, and did not have to experience the relative risk of my bag being in a compartment which may or may not have been near me. This trip also allowed some additional comparison. LB and I were flying together for this trip, and we used similar backpack packing strategies. One of the things I noted, however, particularly on the way home, was that LB kept taking their backpack off and carrying by the handle strap, or simply setting it down. When I asked why, LB said that the pack was making their shoulders sore. I suggested we swap bags for a bit. LB was using the backpack that they also use for school. It's a standard, big-box store bag that one might typically see as a part of a wall-o-backpacks. It's approximately the same size as the Synapse, and LB has been using it for the better part of the past year to cart books and such back and forth. About five minutes into wearing it, it started to make my shoulders sore. As for the rest at six months - the bag shows virtually no wear and tear at this point. The central water bottle holder still works very nicely, and I've only managed to spill my coffee in it once (so far). The only complaint I might have in that regard is that the bottle pocket is not water- (or coffee-) proof, so this event (which involved me carelessly setting the bag down and walking away, not realizing that it had fallen over with the travel mug inside) resulted in coffee filtering down into the adjacent pockets. This may have, possibly, been more my fault than that of the bag. Maybe. As with all of the Tom Bihn products, the Synapse is not inexpensive. However, as is often the the case, where the extra cost reflects thoughtful, careful design, it readily turns out to be worth the difference in price. For most of my professional life I've been a backpack guy. Early on I did work with a handful of bags that would fall more into the "briefcase" category, often centered around carrying a laptop, but these would quickly demonstrate their limitations as soon as one had to walk any kind of a distance carrying them. Shoulder strap or not, any bag big enough to carry a 1990's era laptop makes you sore in a hurry. I became acutely aware of this when I was in graduate school, having to cover territory carrying books and bulky electronics along Milwaukee city streets to get to my class (Marquette University offered parking conveniently located approximately 15 miles away from any classroom[^1] ). And it reminded me of the relative value of a backpack, which I'd used when I had last had to travel a campus with books in tow. To that end I purchased and used a "Backpack Briefcase", designed by Trager, for the longer part of a decade. But when the iPad came out, and it became clear that I no longer would need to carry a bulky laptop or its support crew[^2]. It offered the opportunity to pare down my daily carry to something more streamlined. I began to investigate, and ended up choosing a messenger bag from Tom Bihn - the original Ristretto. This bag has worked well for me for several years. The decreased weight of the iPad means that it isn't problematic to carry the way that the older briefcases were. 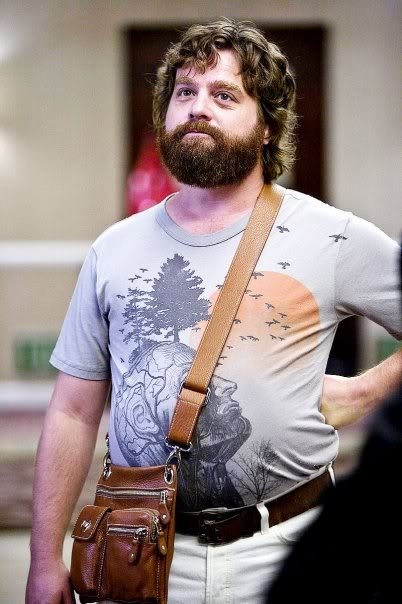 And it's design is more along the lines of a satchel than of a traditional messenger bag, meaning that you look a little like Indiana Jones carrying it. Yes - Indiana Jones. Not this guy. Over the past couple of years, however, I've found that I am traveling more, and as a result I am needing space to carry additional things - particularly food and changes of clothing for working out. For a while I've managed this by periodically carrying two bags - my Ristretto and a backpack borrowed from my kid. But you only have to forget to pick up your second bag on the way out the door a couple of times - leaving yourself either hungry, unable to work out, or both - before the idea of simplifying the number of bags occurs. I've had extremely good luck with the Ristretto - it has performed flawlessly and, seven years in, I find it has weathered well. I've been very happy with it. Given that, I decided to look at the backpack options Tom Bihn had to offer[^3]. Spending a little time on the site, I decided on the Synapse 25. The Synapse 25 ticked off all the boxes for me - organizational compartments in the front that allowed free access to the things that I need on a regular basis, it has a specialized carrying system for the iPad Pro, and has the room in the center that I needed for the additional things I have been using a second bag to carry. It also has one clear bonus feature in the form of a center pocket designed to carry drinks up to the side of a one-liter water bottle. As a person genetically predetermined to spill coffee on himself, the mesh side pockets on most backpacks are a disaster waiting to happen. The Synapse came in a large box right to my home. As you can see, I chose the Burnt Orange/Northwest Sky option. I like orange, and it makes things easy to see and find. I would have preferred a different interior color - maybe "island" - but that wasn't an option. Yup - that's my entire Ristretto being readily swallowed up by the Synapse. I ordered my version with a Cache - a padded internal bag - sized for the iPad Pro. I did not realize until it came that it would include a set of internal "rails" to allow the cache to slide in and out of the bag while keeping it attached. I've been using the Synapse for about two weeks now. The size difference between the Synapse and Ristretto took a little getting used to, but that went by pretty quickly. What became clear was that it does exactly what it promised - it holds everything I want to carry easily, and does so without seeming overly large. It's comfortable to carry fully loaded, and the pockets on the front mean that, when I'm at a work site I can easily get to all of the supplies and materials that I need quickly - they are just a zip away. Similarly, the cache on rails means that you can easily find your device even when the main cargo compartment is fully loaded. And that final, bonus item? The bag really does readily hold a drink in the center compartment. I can easily fit a 16 oz travel mug in the compartment and zip it closed. The sides of the compartment are elastic and taper in towards the bottom to more securely hold the item. It's deep enough to allow for my mug to be zipped into it. It works perfectly, and carrying the drink in the center - instead of on the side - of the bag absolutely keeps things from flying about. Additionally I'm finding myself less likely to leave my cup behind when I'm finished, since I can just put it back in the bag when empty. Thus far the only downside is that the iPad Pro cache appears to have been sized for an iPad Pro without any kind of a case on it. It's a tight fit with the Smart Cover and the ESR backside cover on it; the Smart Cover is designed not to be slippery (for good reason), so it is a bit of work to get it in and out. Two weeks in it is starting to stretch a bit and get easier to use, but anyone using a larger case would want to consider a cache designed for a larger device. Fortunately, the company provides a dimension chart for all of their products, including the caches, so you can measure your device in the case before buying. The Tom Bihn bags and accessories are not inexpensive. If you are someone who changes bags often, or uses them for only a short while before moving on, they may not be for you. If, like myself, you want a bag to use for a decade or longer, they hold up extremely well and easily justify their cost over the longer term. [^1]: Its possible that I am exaggerating slightly. [^2]: Modern laptops notwithstanding, my laptop usage was from an era in which you could not expect to leave home without a power cord. [^3]: For the record, I'd also had good luck with the Trager backpack, and I still use it to carry supplies for presentations (projector, cords, etc). Unfortunately, the company no longer has a web presence, and a little homework suggests that it appears to be defunct. This article indicates "Records at the office of Washington's Secretary of State indicate that the Trager Manufacturing Company, Inc., formally expired on September 30, 2004".